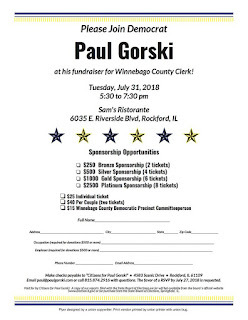 Paul Gorski, Democratic Candidate for Winnebago County Clerk, November 6, 2018.
from 5:30 to 7:30 PM. Email paul@paulgorski.com or call 815.874.2916 to RSVP or with questions. Paid for by Citizens for Paul Gorski. A copy of our reports led with the State Board of Elections are (or will be) available from the board ‘s official website (www.election.il.gov) or for purchase from the State Board of Elections, Springfield, IL. Citizens for Paul Gorski. A copy of our reports led with the State Board of Elections are (or will be) available from the board ‘s official website (www.election.il.gov) or for purchase from the State Board of Elections, Springfield, IL.